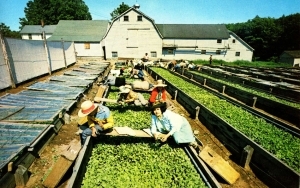 Description: Color postcard shows a group of women working in the tobacco seed beds of a Connecticut River Valley farm. Shade grown tobacco seedlings are grown from seed in hot beds under glass. In late May they are picked from the beds by workers and carried to planters which insert them into the ground.